Mr. Chase, the President of University of North Carolina at Chapel Hill writes Miss Berry to remind her of her standing agreement to present at the Commencement of the University of North Carolina on the 10th of June. He states that a gown will be furnished for the occasion and that she is being awarded an honorary degree through the university. 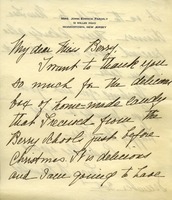 Mrs. John Parmly thanking Miss Martha Berry for homemade candies that were sent to the Parmly residence at Christmas time. Biddle thanks Hammond for including him in the Pilgrimage to Berry, describing Martha Berry as "orderly, well balanced & practical." 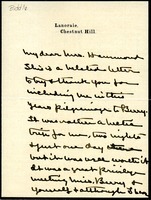 He notes that he has sent Hammond two films, with another to follow shortly. The women of the First Presbyterian Church of Norristown, PA are trying to raise funds to pay off a debt to paint and fresco their church. They wish to sell baskets, or some other item produced by the students at the Berry School, and ask for suggestions to benefit both entities. Also, a check for ten dollars is included to keep some girl at work at the school for the summer. 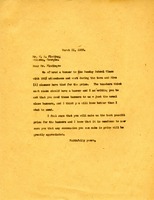 Martha Berry asks the president of the C.F. Pease Company for the donation of a "Junior Blue Printing Machine," and explains the missions and needs of the school. If the company cannot make a donation, she asks for a quote of their lowest price. 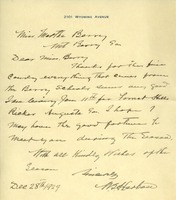 The letter was written to Martha Berry praising Berry College. Along with the letter was a fifteen dollar donation to the school. 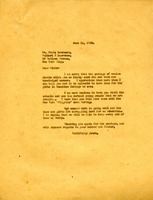 The author of the letter basically wanted Martha Berry to know he was behind her and wished for her continued success. 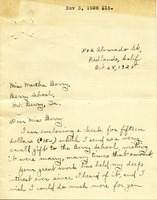 The author also asks Martha Berry to allow one of the girls to write her about the school. The letter is basically fan mail to Martha Berry. 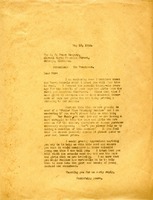 A letter to Mr. Blake thanking him for the package of woolen clothes for the girls in Sunshine cottage. She is also hoping for him to come visit the schools with the New York "Pilgrims" next Spring. 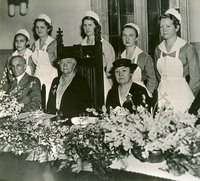 Miss Berry sitting with Mr. and Mrs. Ford in a dining hall. 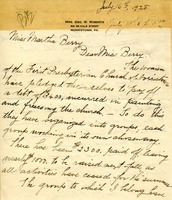 Letter from Miss Berry relaying a message that she is sick and will not be able to keep her engagement with the Association. 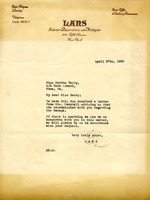 A letter from Martha Berry to Mr. Floding about Sunday School class banners for perfect attendance. 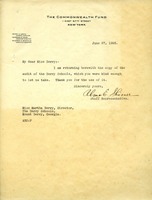 This letter came to Martha Berry along with an audit of Berry Schools. The author also mentions that Martha Berry allowed Commonwealth Fund to take this audit and also thanked her for it. 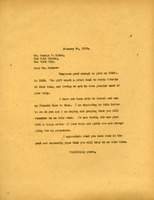 This letter is a request from Martha Berry to receive funds from a Mr. George F. Baker. Martha Berry also mentions the strong need for these funds due to the increasing amount of boys and girls who need an education.